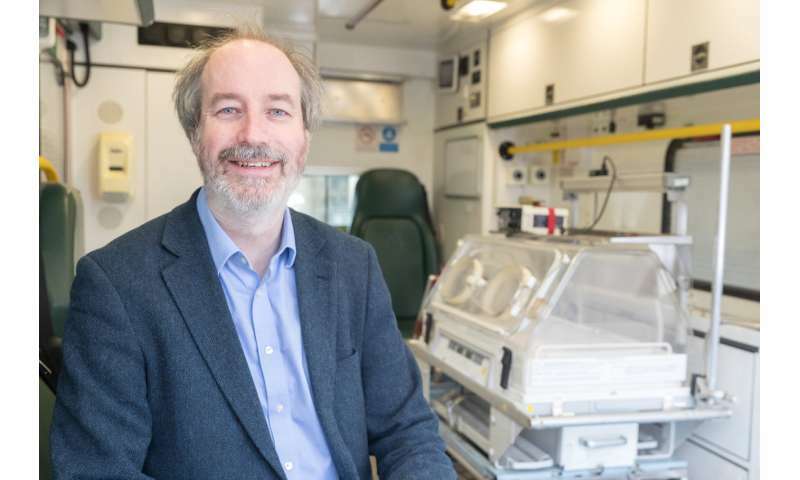 The multidisciplinary team led by Professor Donal McNally, Professor of Bioengineering and Head of the Bioengineering Research Group, along with researchers from the Centre for Healthcare Technologies, has launched a three-year project to develop the Next Generation Neonatal Transport System - the first system of its kind in the world. The System aims to cut down vibration and noise, improve comfort and safety, and reduce the stress that extremely premature babies are subjected to when they are transported to medical centres in a bid to improve neurological outcomes. Over 16,000 neonatal transfers are carried out in the UK every year and this is set to increase. For the majority of babies, this is a safe clinical pathway and ensures that they have access to the care they need and for high-risk babies it increases survival rates. For a small number of high-risk infants, it is also necessary but could also expose them to additional risks from noise, vibration, discomfort and in rare cases, potential accidents involving the ambulance. A detailed assessment, the first of its kind to date, was carried out by Dr Don Sharkey, Clinical Associate Professor of Neonatal Medicine, Faculty of Medicine and Health Sciences, which highlighted the effects of vibration on newborn babies when they are transported. Dr Sharkey said, "Neonatal transport can be potentially hazardous for extremely premature infants or babies requiring specialist care or surgery. While in transit, the infant is exposed to harmful stimuli including mechanical shock and vibration, which could be a factor in the associated additional brain injury observed in these babies. "This can lead to lifelong disabilities and neurological conditions such as cerebral palsy. This type of brain injury is most likely to happen in the first few days of life when many of these babies are transported." Professor McNally said, "This research provides a well-grounded baseline assessment of newborns' exposure to head and torso vibrations, and linear accelerations. More importantly, the study also addresses key issues including if the transport could be made safer, for example by redesigning the incubator or its components, or by exerting control over the route and speed of the ambulance's journey. "Understanding the mechanism and resulting damage of excessive vibration could be the key to developing new strategies to reduce the brain injury seen in these babies. This in turn can result in the lifelong improvement in the quality of life for both the babies and their families." Research has linked transportation to an increased risk of bleeding in the brain of very premature babies, which potentially can lead to cerebral palsy and learning difficulties later in life. Data collected by the team at Nottingham suggest that babies are exposed to vibration levels well above recommended limits for adults, such as lorry drivers, which are linked to headaches, fatigue, circulatory and digestive disorders. The study which has been awarded NIHR Invention for Innovation (i4i) Programme funding, has enabled the research team to travel in the specially equipped research ambulance with these premature babies. This has allowed them to monitor key details including blood flow to the brain and carry out the measurement of bio-markers indicating stress. Dr Sharkey, the clinical lead on this project, believes "By the end of this study we hope to have developed the world's safest neonatal transport system that improves the comfort and safety of the baby, reduces stress and ultimately improves the long-term outcomes for the most vulnerable babies."